Imphal, Feb 28 : Led by Chief Minister Okram Ibobi Singh and Deputy Chief Minister Gaikhangam, Manipur gave a rousing send-off to about 80 BCIM (Bangladesh, China, India and Myanmar) Car Rally participants in Imphal on Wednesday. This historic Car Rally from Kolkata to Kunming (China), which was flagged off by West Bengal Chief Minister Mamata Banerjee in Kolkata on Feb 22, is on its sixth stage from Imphal to Ka Lay in Myanmar. The 12-day rally will end its journey in Kunming in the Yunnan province of China on Mar 5. Earlier, 20 BCIM Car Rally cars had traversed through Jessore, Dhaka and Sylhet in Bangladesh before reaching Imphal on Feb 21 via Karimganj and Silchar in Assam. Sponsored by Tata Motors, ONGC and Autocar, and supported by the governments of these four countries, the BCIM Car Rally comprising the participants from these countries, is being organised and coordinated by the Confederation of Indian Industry (CII) with several government departments, agencies and industrial houses, chipping in with all kinds of help and assistance. Speaking at a grand reception hosted by the Manipur Government, Chief Minister Okram Ibobi Singh said the BCIM Car Rally would spread the message of cooperation and foster friendship among the BCIM countries. Singh also said restrictions in the movement of goods and services and people across the border need to be eased. "We are looking at the opening up of road and rail passages to Bangladesh through Tripura so that our goods can be exported by using the ports of Bangladesh," the Chief Minister said at the send-off ceremony held at the Kangla Fort in Imphal. "It would also highlight the potential of the north-eastern region in India and explore cross-border land trade. Deputy Chief Minister Gaikhangam also wished the Rally a great success. Hundreds of schoolchildren holding flags and flowers lined the streets leading to the Kangla Fort to greet the BCIM Car Rally participants. Many villagers had earlier come out in large numbers waving and cheering at the convoy along the route. 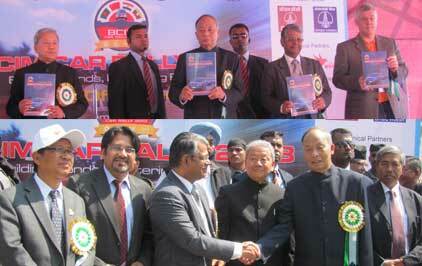 R K Agrawal, Chairman, CII Eastern Region, said the BCIM Car Rally would revive ancient links and also forge new ties. “The BCIM Car Rally not only seeks to highlight the trade potential of the North Eastern Region of India and Kolkata as a whole but also stress the feasibility of freight movement through the land route,” Agrawal said. “BCIM Car Rally will highlight the importance of North East and Imphal as hubs of trade and commerce not only to partner countries but also to the entire subcontinent. The Rally is taking a route which has not been used since World War II and the men and machine reaching China will be pioneers in this odyssey,” he added. Karl Slym, MD Tata Motors, who joined the Rally here along with his wife, said since one Englishman and one English woman are also supporting the rally, the BCIM Car Rally is no longer an affair of Bangladesh, China, India and Myanmar. "This is my first trip to the area and we are planning on a holiday out here. This is about an area of the world that has not witnessed the kind of growth that metros experience. We all are looking forward to driving," he said. Also present at the Send-Off ceremony at the Kangla Fort in Imphal were O. Nabakishore Singh, Principal Secretary, Department of Commerce & Industries, Government of Manipur, and Saugat Mukherjee, Regional Director, CII Eastern Region. The historic Car Rally, which has a motto of 'Building Bonds, Fostering Friendship', seeks to stimulate interest among all stakeholders in deepening BCIM cooperation. The 3028-km rally's next stop is Ka Lay before heading to Mandalay, Ruili and then to Tengchong, Dali and Kunming in China where it is will culminate on Mar 5.